Hii Friends...I hope you all are fine. I hope my previous posts were beneficial for you. Well, today am back with an Amazing software named as T3Desk. It is a very Interesting software which helps you to give a 3D look to your blog. It gives a third dimension look to your Windows. It lets you give a Transparent look to your Windows. Well, it is a lightweight software. It is an unique application. 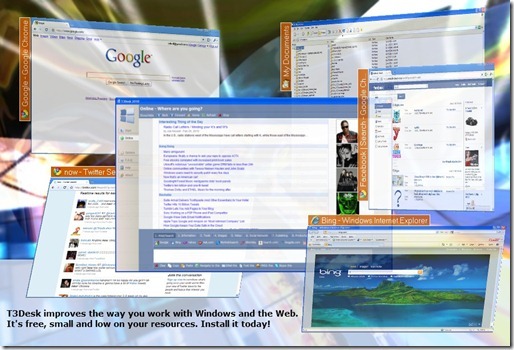 Using this software, your windows can be zoomed , Flipped , moved in almost anyway you want. You can surf more easily using T3Desk. You can also configure your windows Dimension looks, Transparency Effect and much more. This software will work on almost all versions of Windows. So, download this RAR file and give your Windows a 3D look. That would be great, I've come to love the feature of Windows7 when you switch screen but this is more awesome! Really cool software. Asking about comment is good because i love to do that. Reading your post was very intresting because it helps alot. Cool site! I just typed the site name(hackeasy.com) as a timepass and got a cool gift here.